Belthangady, Dec 6, 2015: Speaking after inaugurating the 12th State-level manuscript conference organised by Kannada University, Hampi, Sri Manjunatheshwara Samskruthi Samshodhana Prathishth-ana, Dr Ha Ma Nayak Research Centre and Kannada Department of SDM College. 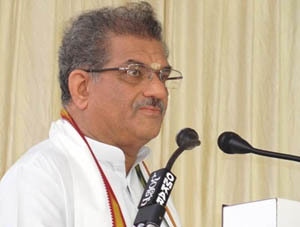 Sri Kshetra Dharmasthala Dharmadhikari D Veerendra Heggade said manuscripts are the treasure houses of all literary forms. He went on to say that manuscripts are the assets of the country and stressed on the need to conduct research on them. Dharmadikari Heggade said he has been collecting and preserving manuscripts from the last 40 years. Universities may utilise the manuscripts in the collection of Dharmasthala for research. Also, the manuscripts in various mutts and temples should be used for research. The students must take interest. The Conference president Dr Veeranna Rajoora said, "Manuscripts contain the knowledge of our ancestors and they are a part of our lives. The application of modern technology is necessary for the scientific study of the manuscripts. Hampi Kannada University Vice-chancellor Dr Mallika S Ghanti said the collection and study of manuscripts requires a lot of concentration, dedication and hard work. She called upon women to come in more numbers to work in this field and added that the university encourages the study of manuscripts. A programme was held in memory of veteran scholar Yerthur Shanthiraja Shastry on the occasion.